Samsung has officially taken the wraps off of the long-awaited Galaxy S III smartphone at the Mobile Unpacked press event in London. The new flagship handset packs a quad-core 1.4GHz Exynos processor and a GPU that is said to be 65 percent faster than the chip found inside the Galaxy S II. 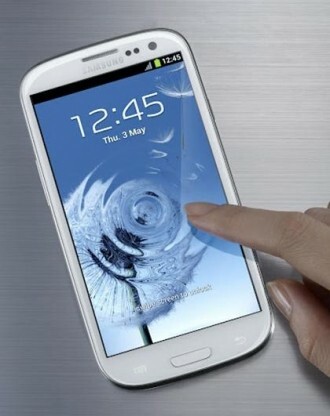 Follow up: Read our Samsung Galaxy S III hands-on article here. Other key specifications include a 4.8-inch HD Super AMOLED screen (1280 x 720 resolution) with a 306 ppi density, 1GB of RAM, an 8MP rear shooter, 1.9MP front camera and storage options in the neighborhood of 16GB, 32GB and 64GB. There’s also a removable 2,100 mAh battery, a micro-SIM slot, a micro-SD card slot, a micro-USB port and support for Bluetooth 4.0, WiFi Direct, DLNA and NFC. There is a Siri-like voice assistant called S Voice that takes commands from the user and performs varying tasks asked of it. Another new technology is called Smart Stay, which uses the front-facing camera to “watch” the user’s eyes. When the phone doesn’t detect any eyesight, it knows to go into sleep mode. The phone will ship with Android 4.0 Ice Cream Sandwich with a TouchWiz layer on top. Engadget tells us that the phone will launch with HSPA+ but an LTE version will eventually come down the pipe. In terms of sheer aesthetics, the Galaxy S III shares more than just a naming scheme with the Galaxy Nexus. The device measures just 8.6mm at its thickest point and weighs 133g (4.7-ounces). Two colors will be available at launch: Pebble Blue and Marble White.